This is the second installment in The Plant Speaks, an ongoing series of personal notes from the members of 10 Ft. Ganja Plant about their favorite albums. Whenever I reflect upon my first trip to Jamaica, there is one album that is forever linked to those memories; one album that instantly transports me back to the sweaty streets of Kingston every time I hear it. My friend and I landed in Montego Bay in the midst of a national state of emergency. Most tourists had been evacuated from the island shortly before our arrival. As we climbed into the rickety taxi, a radio news report informed us that the number of taxi drivers killed in Kingston that year had just reached nine. As soon as we had reached our tiny motel room and began to unpack our bags, we were greeted by a hasty knock at the rear door of the room. The knock came from a local man hustling some ganja. We informed him that we’d already bought plenty from our cab driver and he went on his way. Reaching back into my single piece of luggage, I realized that we had only brought two cassettes to listen to on our pilgrimage to the birthplace of reggae. One was Dadawah: Peace and Love by Ras Michael & the Sons of Negus, a spaced-out, psychedelic dub nyabinghi extravaganza. 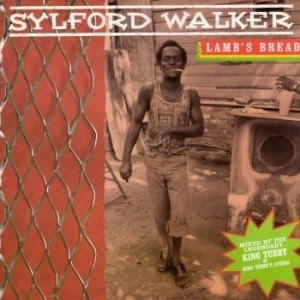 The other, and the only true reggae album we had, was Lamb’s Bread by Sylford Walker. Walker is lamentably obscure, even among fans of roots reggae music. A couple of his early singles for Joe Gibbs, such as “Burn Babylon” and “Jah Golden Pen” can be found on various compilations, but his true crowning achievement to date is the seminal Lamb’s Bread . This record collects some of the singles Walker voiced for legendary producer, musician, and singer Glen Brown’s Pantomine label. Featuring an all-star lineup of JA’s greatest session musicians, including the Barrett brothers, Santa Davis, Robbie Shakespeare, Ansel Collins, Tommy McCook, and many more, the tracks were voiced and mixed at the great King Tubby’s studio. Walker’s incredible chanting vocals are often likened to Burning Spear, yet his style is unique and inimitable. The lyrics are always conscious and cultural, and often apocalyptic, as when Walker asks “weh you ago tell Jah on eternal day?” And the hard-hitting “Cleanliness is Godliness” is almost too tough to believe. It’s as if Tubby, Brown, Walker, and company managed to distill roots reggae down to its most raw, pure form. Somewhat appropriate when one considers that Sylford used to make his living brewing and selling roots tonic from his home on Gold Street in Kingston. As the taxi sped into Kingston down Spanish Town Road, we were informed by the driver that he wouldn’t be stopping for any signs or traffic lights for a while. To our left, the midday heat distorted the view over the hot tin-roof shacks of Trench Town. To our right lay the sprawling development called Tivoli Gardens, once called “Back-o-Wall” before the original community was bulldozed by the government. As we rolled tensely through the area, strains of Walker’s “Babylonians” struck home: “Each and every day I walk up, all I see is violence…” A sobering reminder of the realities that make up everyday life for an unfortunate majority of the world’s population. For the rest of the trip, the sounds of Lamb’s Bread accompanied us everywhere we went, from the old site of Randy’s Studio upstairs at 17 North parade, to Idler’s rest on Orange Street, and even uptown, from Lee Perry’s neighborhood of Washington Gardens, to the king of reggae’s uptown address at 56 Hope Road. Ironic that as two young white foreigners trod the island listening to Sylford Walker and Ras Michael, the prevailing definition of roots music in JA at that time was extended to such artists as Sizzla and Buju Banton. Most Jamaicans live unaware of the massive contributions their very friends and neighbors have made to the world of music, arts, and culture.